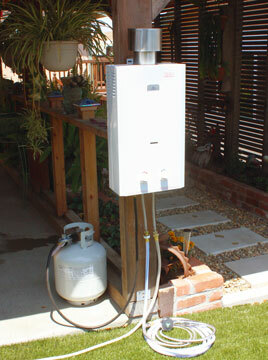 The Eccotemp L10 propane tankless water heater is made for a more permanent installation. It comes with standard 1/2" NPT fittings for permanent plumbing or use the adapter to hook it up to a garden hose. The regulator and gas hose connect to a 20 pound grill tank. Two "D" cell batteries provide automatic ignition, so no electricity is needed and no gas is wasted on pilot lights. Delivers up to 2.65 gallons per minute of continuous hot water. The L10 is ideal for hunting lodges, base camps, off grid homes, cabins, potting sheds, barns and horse trailers, or even adding hot water to your pressure washer.